The female guides at IMG created our women's programs because we want to help you achieve your goals in the mountains. Whether you are a complete beginner or a more experienced climber, want to climb rocks or volcanoes, want a guided climb or an in-depth skills seminar, or you have a more specific goal in mind, we can help you make it happen! Our programs offer a supportive environment for you to challenge yourself, build your competence and confidence in climbing, and have a blast on an unforgettable adventure with other like-minded women. Check out the links below for more information on our scheduled climbs and seminars, and for details on designing a custom program. Please contact IMG with any questions, or if you would like to be put in touch with one of our female guides. We look forward to meeting you and sharing a great adventure. Join us August 2-7, 2019 for our all-women's 6-day mountaineering seminar and summit climb of Mount Shuksan. We will hike through a dense forest and subalpine meadows to our camp in the alpine zone with amazing views of the surrounding peaks. We will train you in critical mountaineering skills including glacier travel and crevasse rescue, then we will make a summit attempt that includes a roped glacier approach to the summit pyramid, which is 600' of easy to moderate belayed rock climbing to the tippy top. Join us June 27-30, 2019 for our all-women's climb of Mount Rainier via the Disappointment Cleaver route. After climbing to camp Muir on Day 1, Day 2 will be spent acclimatizing, training in cramponing, ice axe arrest, and rope travel, then moving to our high camp at Ingraham Flats for our summit bid on Day 3. You will have all female guides and be climbing in the company of other strong women with a common goal. Whether you have specific skill sets you want to focus on developing, a particular climbing objective in mind, or specific dates that you need to plan your adventure, you can customize a trip with IMG's female guides that will suit your needs! Choose the dates, number of participants, venue, and curriculum, to tailor the experience for your current skill level and ultimate goals. Many of our custom trips are executed in the North Cascades and can include skill-building sessions and summit bids on glaciers and/or rock. You choose the dates, the venue, the climbers, and the curriculum. Possible curriculum objectives could include cramponing, ice axe arrest, roped glacier travel, knots and hitches, building snow anchors, crevasse rescue haul systems, solo crevasse rescue, expedition camp building, rope ascension, ice climbing, rock climbing, and belaying and rappelling. Please contact the IMG office at 360-569-2609 for information about guided rock or ice climbing and instruction. I recently climbed Mount Rainier with three female IMG guides, and I was absolutely blown away. They're professional, supportive, strong, and fun. 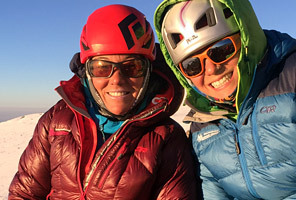 I hadn't thought it would make a difference for me to climb with other women (instead of with men), but it turned out to be a highlight of my adventure. People, especially women, ask me all the time: 'Why do you like to climb mountains?' IMG's all-women's climb put me in touch with women who already know the answer to that. Your guides and your company are so far above the rest of the industry that there is just no comparison... I will absolutely NEVER climb with any other company. Why would anyone want to experience anything less than what your company offers? A woman can and should do everything a man can do, and do it without ceasing to be female.